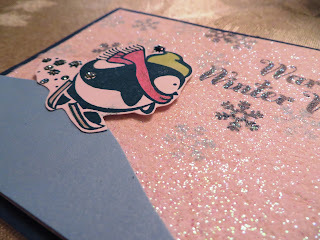 Stamp Happy: Winter Cards ... Penguins and bears...oh, my! 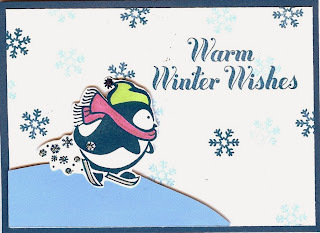 I LOVE winter stamp sets...penguins...polar bears...snowflakes (and owls, too, if I can winterize them). 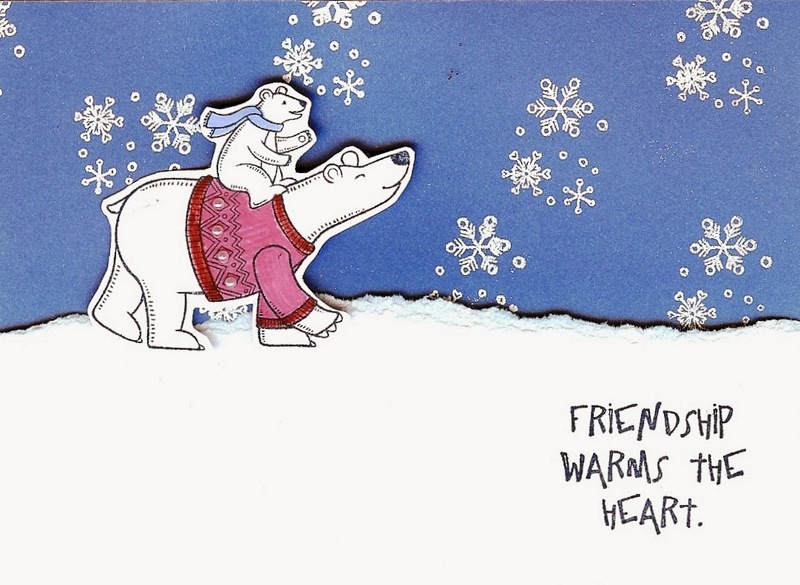 Last month we made this card at card class with the new stamp set Polar Bear Holiday (C1557, $13.95). 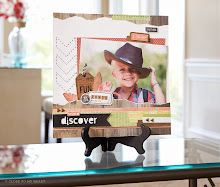 It's similar to a stamp set that CTMH came out with ages ago, and I loved that one, too. 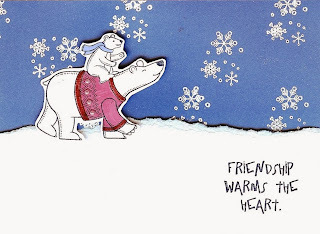 I stamped the bear in Outdoor Denim and colored it in with Hollyhock and Cranberry markers. Bitty Opaques give his sweater a little dazzle. The snowflakes are heat embossed with white embossing powder (which we no longer carry) onto Indian Corn Blue paper for the sky. The 'hillside' is torn White Daisy card stock. I cut the bear out and popped him up with foam mounting tape. Very cute. Not too hard, but it makes people smile. The penguin card I made is with the Hostess Exclusive stamp set Wintery Wishes. Also LOVE this set! (penguin addiction). It's basically the same card as the bear one, just a different background. 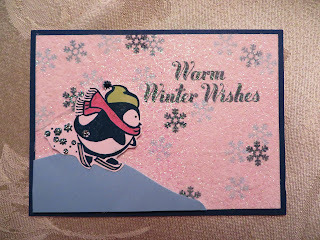 For my card classes this month, we're making this card, but gluing a used dryer sheet to the top of the white background, sprinkling it with glitter to make it super cool and snowy looking! Pacifica Card Stock (for the card front) 4" x 5 1/2"
4. Go to your glitter container and sprinkle the glitter on the dryer sheet. Shake off the excess. Press the glitter that's sticking onto your card. 5. Cut your snowy hillside. Stamp and cut the penguin out. 7. Glue it all to the Pacifica card stock; Glue the Pacifica Card stock on to the card base. * Make sure your dryer sheet doesn't have any of the fabric softener left on it. I ended throwing a bunch of the used dryer sheets into a wash bag and washing and drying them to be sure the softener was all gone.